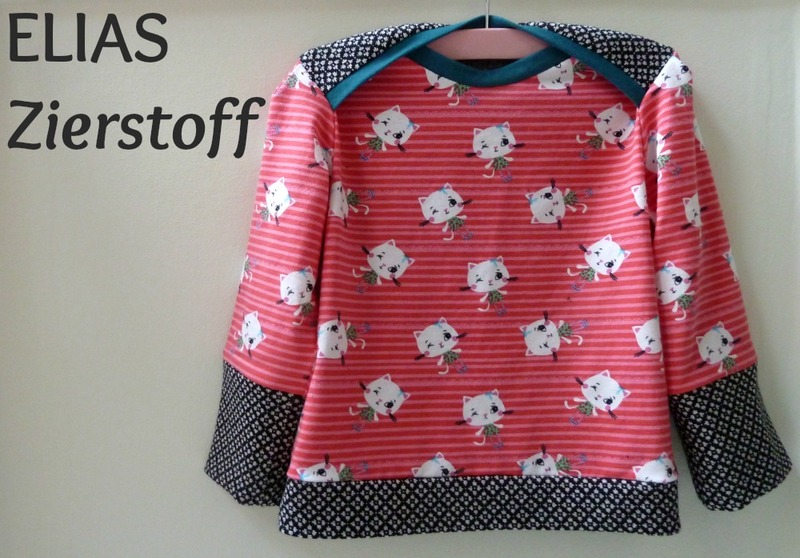 Zierstoff's ELIAS Top, Plus 20% Off! Wowzers! In between starting a new job and getting ready for the Christmas holidays, I've barely had any time to sew...which is scary considering I'm still one project off my #vintagepledge! Speaking of the pledge, have you entered our end-of-year competition yet? Don't miss out on our amazing prizes! Anyway, I did find time for some mini sewing recently, which I always enjoy. I was kindly sent the unisex ELIAS pattern by Zierstoff, a German-based pattern company run by two passionate mums (Ilka and Joanna) with over 100 PDF patterns under their belt! Their patterns range from accessories and homeware to garments for kids, teens and adults...quite the selection! Better still, they're offering a generous 20% off all Zierstoff patterns until 13 January 2016! Just use stitch2015 to claim your discount. ELIAS is available in two size ranges (6mts - 5yrs and 5yrs - 12yrs) and includes cute variations like the one I made, contrast cuff-less sleeves and an easy dress hack. The instructions and photos are pretty clear, and even though some terminology is slightly lost in translation, it's not hard to decipher. I must admit that I didn't really need to follow the instructions, but for the less experienced stitchers, Zierstoff have filmed step-by-step tutorials to accompany many of their patterns...including ELIAS. When I shared a preview on Instagram, loads of you said you'd love a top like this for yourselves. Well, you're totally in luck as you can easily recreate it using Jennifer Lauren Vintage's Bronte Top! You can also get the kitty fabric from Plush Addict (available in blue too). The teal and monochrome prints are from my stash, so have a good look through yours as I'm sure you have some scrap gems knocking about. Thank you...it was a fun make! Thanks again for the top Marie - and it has survived the wash no problem! You're most welcome and thank goodness! This is so cute! I can't deal with it!